By the 1750s the division parcels of the Medieval Hewish Field were more or less finalised. 'The Field' was the largest area of the original common field and in Edward Watts' map of 1806 (see below) it is labelled as "Mr Goodford's Field" - Mr Goodford being Yeovil attorney Henry Goodford. By the time of the 1846 Tithe Apportionment Goodford had sold The Field (Parcel 301) and the adjoining cottage, garden and orchard (Parcel 300) - now the site of Telford House on the corner of The Park and Clarence Street - to banker and fellow Yeovil solicitor William Lambert White who lived in the grand Pitney House in Kingston. Another early map of the land on which Telford House would be built, Day's map of 1831, shows the area as a small, empty field although Edward Watts' map of the same year shows that the small thatched cottage (see Gallery) had been built by this time. The cottage survived until 1935. 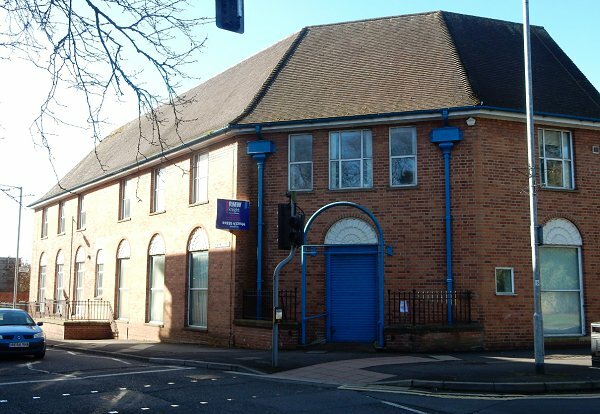 The Yeovil telephone exchange had been (at least until 1917) located at 2 Court Ash. Although this building was put up for sale in 1917 (see Gallery), it does not mean that the exchange moved at this time. In 1932 the new Post Office relocated to King George Street from today's WH Smith premises in Middle Street. At the same time as the new King George Street was being built, a new telephone exchange was being built at the Park Road end of Clarence Street, in the same plot as the white cottage referred to above. The new 1932 building, Telford House, was originally T-shaped in plan with a three-bay elevation to Clarence Street. It was extended during 1935-6 with a further three matching bays and a narrower central bay and is marked with a scarce datestone for the year of 1936 when Edward VIII was briefly on the throne before his abdication. This extension necessitated the demolition of the cottage. 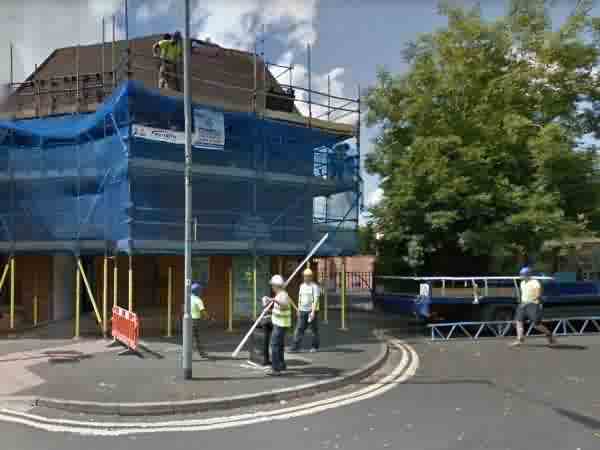 Sadly, during the construction of the extension, one of the bricklayers working on the project died in a cupboard in the boiler room of the building (see Gallery). In 1972-3 the new Post Office sorting office in Huish was built and became the new home of the Yeovil telephone exchange. Certainly by the summer of 1973 Telford House was occupied by the Borough Architect's Department (see last photo in the Gallery) of Yeovil Borough Council (and, I think, Building Control). I lost track of who occupied Telford House after this, until the 2000s when it was premises of the Department of Work and Pensions. The DWP had moved out by 2014 and the property was put on the market. 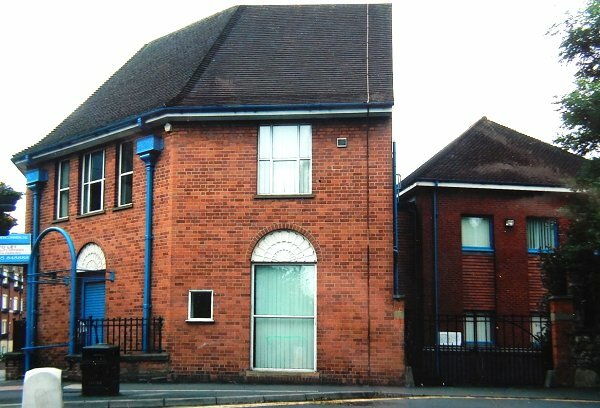 By the end of 2015 the building had been acquired by Porter Dodson solicitors, who remain there today. 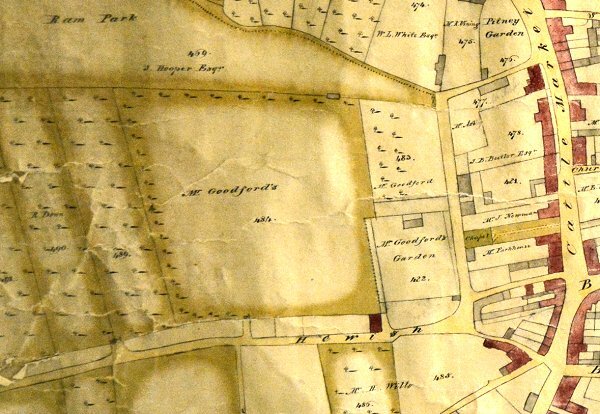 Part of Watts' map of 1806 showing 'The Field' at centre labelled "Mr Goodford's" as, indeed, were the two parcels to its east that bounded the eastern side of what would become today's Clarence Street. Parcel 483, the small field to the north, bounded to its north by the extension of Ram Park, would become the site of Telford House. 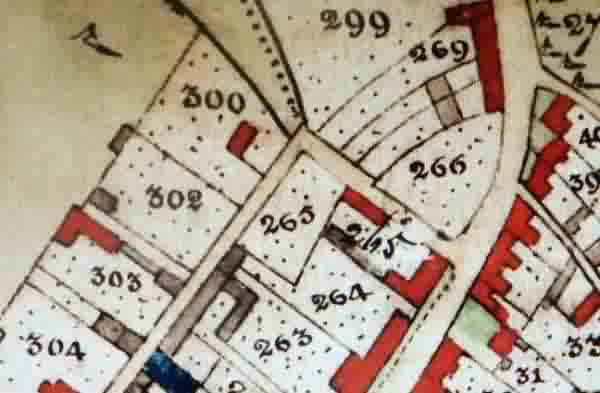 Part of Edward Watts' 1842 tithe map of Yeovil. Parcel 300 shows the cottage on the site of what would become Telford House. 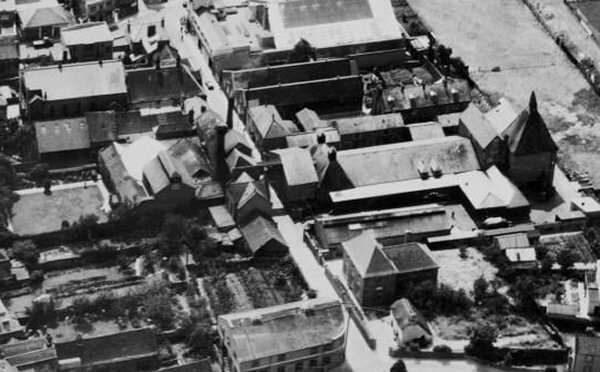 This 1935 aerial photograph shows Clarence Street running diagonally down the centre of the photograph to join with Park Road at bottom, right of centre. In the lower right quadrant is the section of Telford House built in 1932 and alongside is the tiny white thatched cottage. 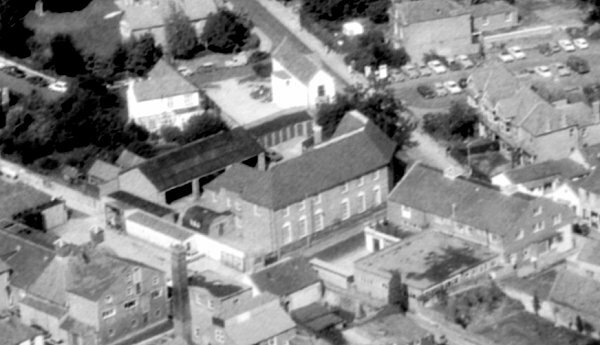 An aerial photograph of 1972 with Telford House at centre. To its rear are open garages for engineer's vehicles, and at the end of the building is a small Nissen-type hut. By this time the high brick wall that had separated Telford House from Clarence Street had been reduced in height and surmounted by railings. The railings survive today but only along the southern part of the wall. 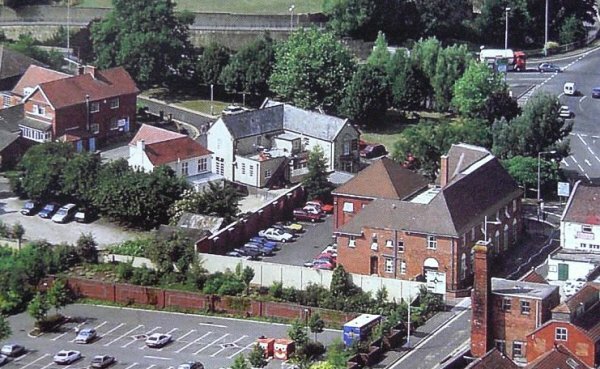 An aerial photograph of 1994 with Telford House right of centre. 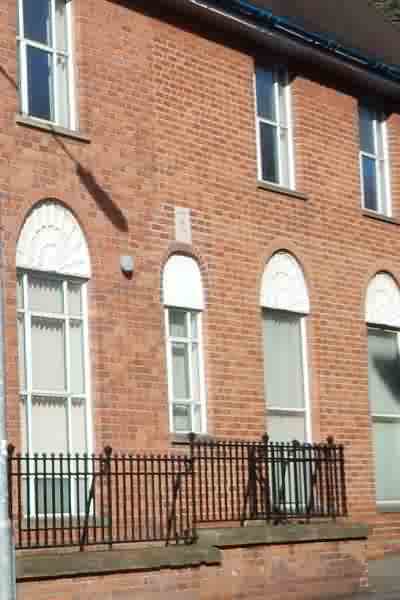 A new extension has been inserted behind Telford House, not seen in the previous photograph. 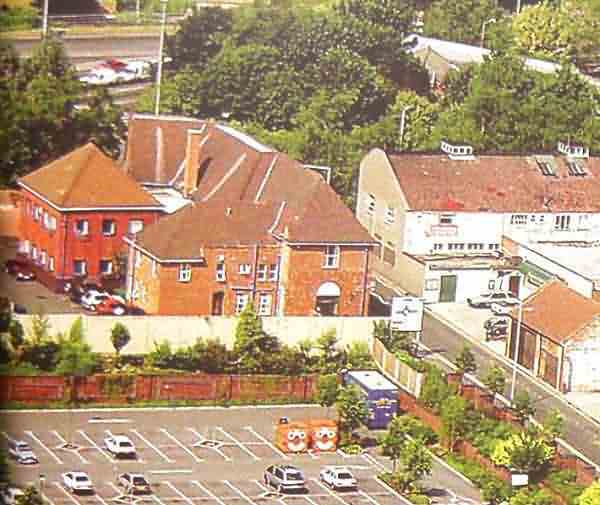 Another aerial photograph of 1994 with Telford House peeking over the fence at Tesco's new single storey car park. 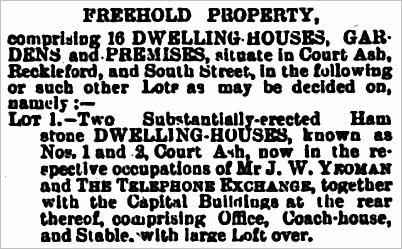 The notice of sale of the telephone exchange at 2 Court Ash from the 16 February 1917 edition of the Western Chronicle. 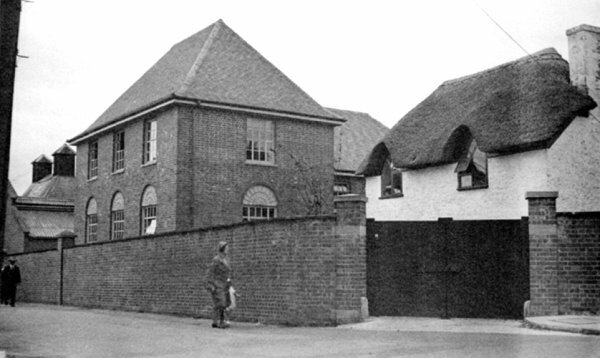 Photographed in 1932, the original three-bay Telford House is at left and the white thatched cottage at right. The cottage was demolished to make way for the 1935-6 extension to Telford House. 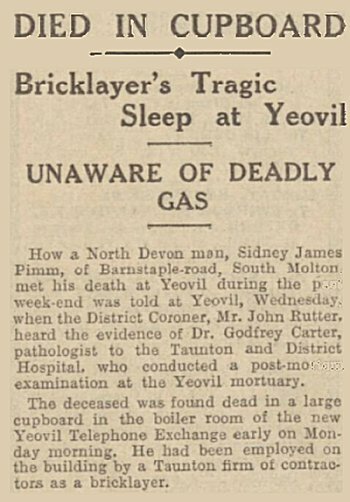 The report on the death of a bricklayer in the building from the 6 November 1936 edition of the Western Gazette. An advertisement for night telephonists - who had to be men aged over 30 - during the Second World War. The advertisement is from the 24 January 1941 edition of the Western Gazette. 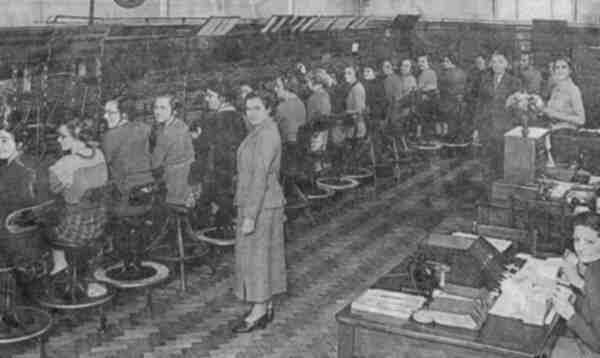 A photograph (reproduced from an old newspaper clipping) showing the original telephone exchange in Telford House in 1937-8. 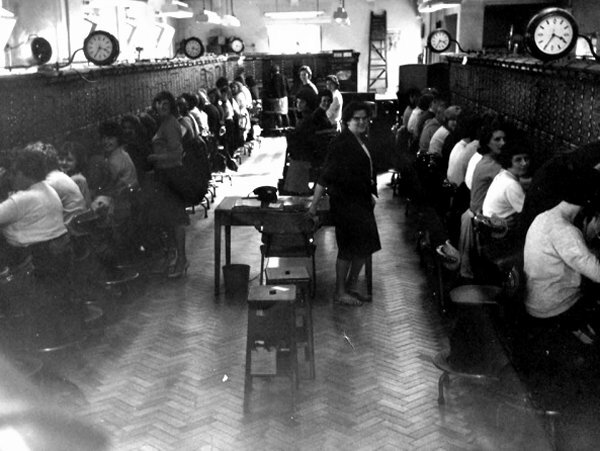 A post-war image of the hugely-enlarged switchboard room at Telford House. I wonder why they didn't just have one big clock at the end of the room? 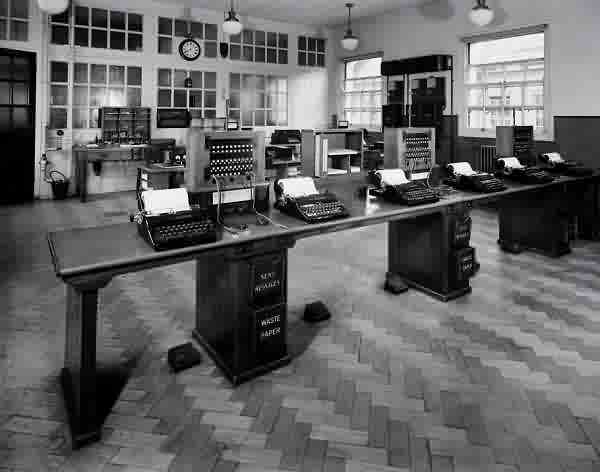 New equipment in Yeovil Telephone Exchange in Telford House. Photographed in 1939. 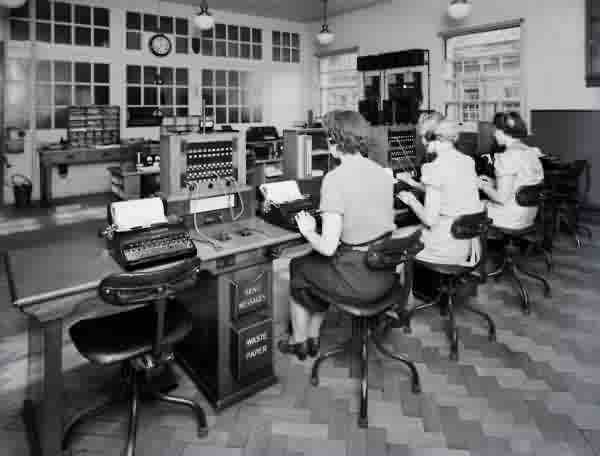 The exchange shown without telephonists to give a better idea of the equipment layout. Photographed in 1939. 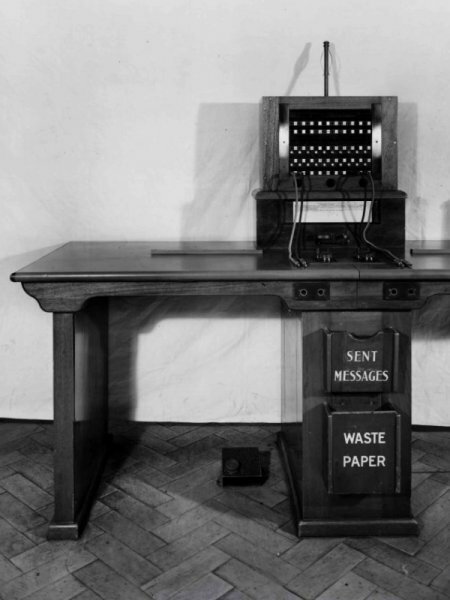 An individual telephonists station. Photographed in 1939. 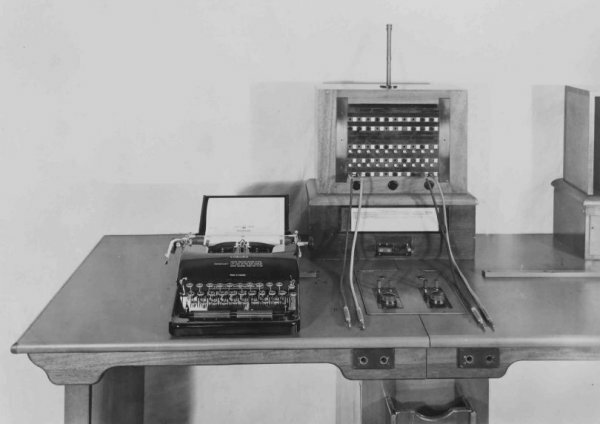 An individual telephonists station with the addition of what looks like a typewriter but is probably a Telex or telegram machine. Photographed in 1939. Telford House seen flat-on from Park Road, with the later infill extension at right. Photographed in 2006. 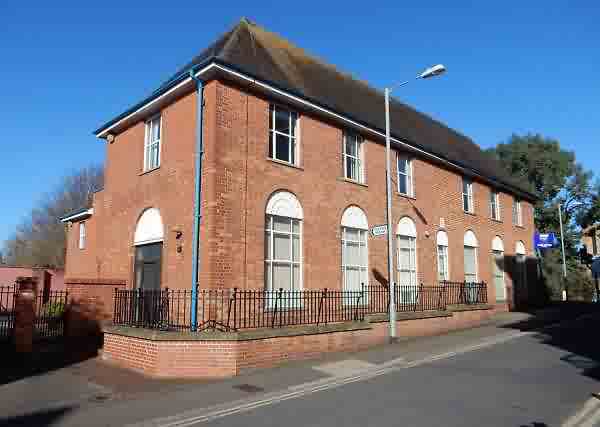 Part-built in 1932 as Yeovil's telephone exchange and extended in 1936. (I worked here for a couple of years from 1973 when the Borough Architect's office was on the first floor before moving to King George Street). Photographed in 2013. The Clarence Street elevation of Telford House. At this time the building was empty and on the market. Photographed in 2015. The change in brickwork is noticeable in this photograph of 2015. The original 1932 building to the left, the 1935-6 extension to the right. 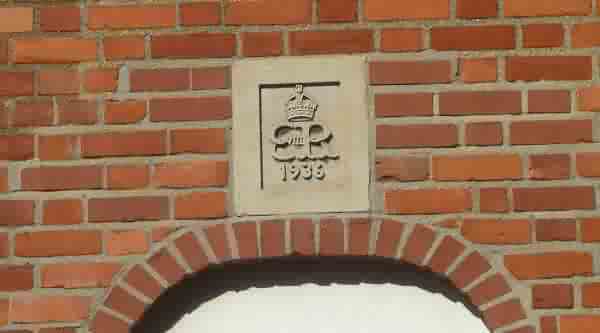 It is unusual to find a datestone for the year of 1936 when Edward VIII was briefly on the throne before his abdication. This is on the wall of the 1935-6 extension of Telford House, facing Clarence Street. Photographed in 2013. The building underwent improvements, etc. in readiness for occupation by Porter Dodson during the summer of 2016. 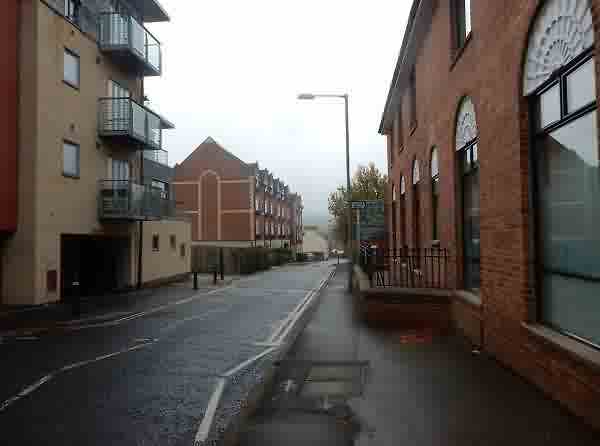 The length of Clarence Street viewed from close to its northern end and the junction with Park Road. At left are the flats that were built on the site of the old Gardens nightclub and at right is Telford House. Photographed in 2015. .... and just to prove that I did go to work - this is me at my drawing board. 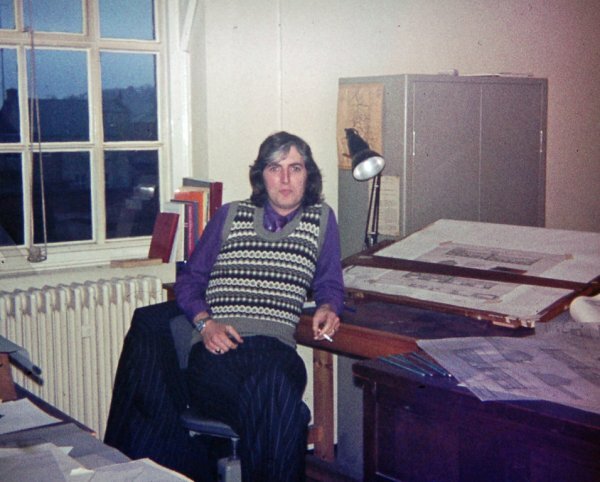 This was upstairs in Telford House in 1974 when it was the drawing office of the Borough Architect's Department of Yeovil Borough Council.